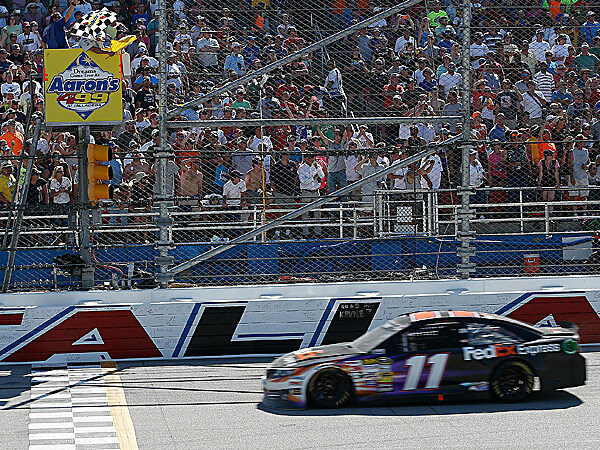 It’s been a season for missed opportunities for Denny Hamlin in 2014, but a surprising win at Talladega Superspeedway means he should be high enough up the standings to qualify for the Sprint Cup championship chase, giving Joe Gibbs racing their second race winner of the season. Hamlin seemed like an unlikely winner until the final restart, blowing past Kevin Harvick, who eventually finished 7th, thanks to some help from behind, courtesy of Kyle Larson who was lineup up behind him. When Harvick got stranded in the middle lane, Larson couldn’t provide him with the same kind of support. 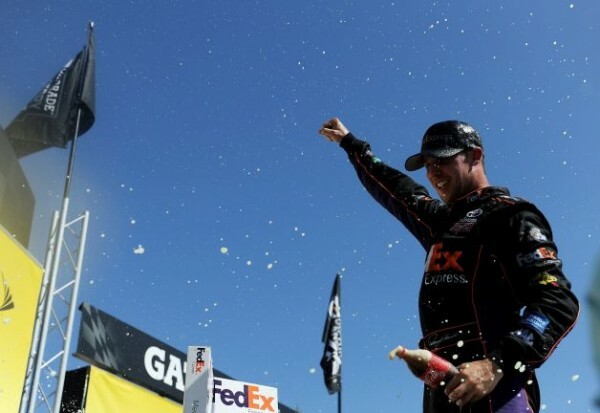 It still wasn’t over for Hamlin, but an accident deep in the pack scattered debris and a caution was thrown after a bumper was spotted laying on the surface. This might have prevented Greg Biffle, who finished second, who was in the lead for 58 laps on five different occasions, more than anyone else, from making one final challenge and catch up with the drifting Hamlin. It was a great day for Toyota, finishing in three of the top 4 spots, as Clint Bowyer and Brian Vickers finished at 3rd and 4th. Chevrolet took all the spots from 5th to 9th, but most of the guys near the top of the chart in the Sprint Cup standings weren’t in contention for the victory: Jeff Gordon didn’t finish the race, and so didn’t Matt Kenseth. Kyle Busch finished 12th, while Dale Earnhardt Jr. was 26th overall. Danica Patrick got the right kind of attention this time, leading the race for six of the first 12 laps. That’s a new record for a woman at Talladega, and her 22th place finish (29th overall this season) was also a record for a woman at the race track. Hamlin opened the season winning two exhibition races at Daytona, but now he’s 12th in the Sprint Cup standings, 55 points behind Gordon. He finished second in the Daytona 500 before finally winning a drag with Harvick, pulling away for his first victory of the year and his second top 5 finish. It’s his first win on a restrictor-plate race track.